A kayak is a small, lightweight, human-powered boat. Long and narrow in shape, it typically has a deck that covers the hull. A paddler sits in a cockpit, which is an opening near the center of the deck, and propels the boat with a double-bladed paddle. The kayak was used by the native Ainu, Aleut, and Eskimo hunters in sub-Arctic regions of northeastern Asia, North America, and Greenland. Traditional kayaks typically accommodate one, two, or occasionally three paddlers who sit facing forward in one or more cockpits below the boat's deck. In some cases, a spraydeck or similar waterproof garment is attached securely to the edges of the cockpit, preventing the entry of water from waves or spray and making it possible (in some boat styles) to roll the kayak upright again without it filling with water or ejecting the paddler. Modern kayaks come in a wide variety of designs and materials and are made for specialized purposes. Sea kayaks, for example, are built for travel by one or two paddlers on open water, often trading maneuverability for seaworthiness, stability, and cargo capacity. Whitewater kayaks can be highly maneuverable boats, usually for a single paddler. Surf kayaks are long, narrow boats for surfing breaking waves. Racing kayaks are designed for speed and usually require substantial skill to achieve stability. Sport kayaker at Great Falls, Virginia. Kayaks and canoes are both long and narrow boats that are powered by one or more paddlers. In some parts of the world, kayaks are referred to as canoes. There are, however, distinct differences between a kayak and a canoe, in terms of their design and history. A kayak has lower gunwales and typically sits lower in the water than a canoe. Also, a kayak has a deck covering the hull, thereby preventing water from entering the hull. A canoe, on the other hand, does not have a deck. A kayak is propelled with a double-bladed paddle by a seated kayaker, but a canoe is propelled with single-bladed paddles by a kneeling or sitting paddler. Also, kayaks usually have a lower overall cargo capacity than a canoe of similar length. The label "kayak" is often misapplied to other small, human-powered vessels not descended from the kayak tradition. They include multi-hull or outrigger boats and those propelled by pedals. Boys in kayak, Nunivak, Alaska, photographed by Edward S. Curtis, 1930. Kayaks (Inuktitut: qajaq, Inuktitut syllabics: ᖃᔭᖅ) were originally developed by indigenous people living in the Arctic regions. They used the boats to hunt on inland lakes, rivers, and the coastal waters of the Arctic Ocean, North Atlantic, Bering Sea, and North Pacific oceans. These first kayaks were constructed from animal skins (such as seal) stitched together and stretched over a wooden frame made from collected driftwood, as many of the sites of their construction were treeless. Archaeologists have found evidence indicating that kayaks are at least 4,000 years old. The oldest still existing kayaks are exhibited in the North America department of the State Museum of Ethnology in Munich. Native peoples made many different types of boat for different purposes, but the term "kayak" is now used broadly for the class of boat described above. The baidarka developed by indigenous cultures in Alaska was also made in double or triple cockpit designs, and was used for hunting and transporting passengers or goods. An umiak is a large, open, sea canoe, ranging from 17 feet (5.2 m) to 30 feet (9.1 m), made with seal skins and wood. It was originally paddled with single bladed paddles and typically had more than one paddler. The modern version of a tuilik is a spraydeck made of waterproof synthetic stretchy enough to fit tightly around the cockpit rim and body of the kayaker. It can, however, be released rapidly from the cockpit to permit easy exit from the boat. The native kayak was built to conform to the user's body measurements, for maximum maneuverability. For example: the length was typically three times the span of his outstretched arms. The width at the cockpit was the width of the builder's hips plus two fists (and sometimes less). The typical depth was his fist plus the outstretched thumb (such as that of a hitch-hiker). Thus typical dimensions were about 17 feet (5.2 m) long by 20-22 inches wide by 7 inches (180 mm) deep. This measurement style confounded early European explorers who tried to duplicate the kayak because each kayak was a little different. Baidarka style, from the Alaskan & Aleutian seas, is the oldest design. Its rounded shape and numerous chines give it an almost blimp-like appearance. West Greenland kayaks, with fewer chines and a more angular shape, with gunwales rising to a point at the bow and stern. East Greenland kayaks that appear similar to the West Greenland style, but are often more snugly fitted to the paddler and possess a steeper angle between gunwale and stem, lending better maneuverability. Most of the Eskimo peoples from the Aleutian Island eastward to Greenland relied on the kayak for hunting a variety of prey: primarily seals, though whales and caribou were important in some areas. Skin-on-frame kayaks are still being used for hunting by Inuits in Greenland. In other parts of the world, builders are continuing the tradition of skin-on-frame kayaks, albeit with modern skins of canvas or synthetic fabric. Contemporary kayaks trace their origins primarily to the native boats of Alaska, northern Canada, and Southwest Greenland. Wooden kayaks and fabric kayaks on wooden frames (such as the Klepper) dominated the market up until the 1950s, when fiberglass boats were first introduced. Rotomolded plastic kayaks first appeared in 1973. The development of plastic kayaks arguably initiated the developed of freestyle kayaking as we see it today, since plastic boats could be made smaller, stronger, and more resilient than those made of other materials. This Greenland paddle is 7 feet (2.1 m) in length, and much narrower than European paddles. There are numerous specialized types of modern kayaks. They may be broadly categorized according to their application as sea kayaks. whitewater (or river) kayaks, surf kayaks, and racing kayaks (flat water, whitewater, or slalom). Many hybrid types exist as well, broadly labeled recreational kayaks. Sea kayaks are typically designed for travel by one or two paddlers on open water and in many cases trade maneuverability for seaworthiness, stability, and cargo capacity. Sea-kayak sub-types include open-deck "sit-on-top" kayaks, recreational kayaks, and collapsible "skin-on-frame" boats. 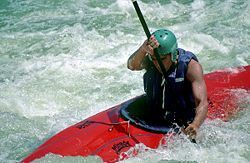 Whitewater kayaks are in some cases highly maneuverable boats, usually for a single paddler, and include such specialized boats as playboats and slalom kayaks. White water racers combine a fast, unstable lower hull portion with a flared upper hull portion to combine flat water racing speed with extra stability in big water: they are not fitted with rudders and have similar maneuverability to flat water racers. Surf kayaks, often called "surf skis," are specialized narrow and long boats for surfing breaking waves and surf-zone rescues. Racing kayaks are designed for speed, and usually require substantial skill to achieve stability, due to extremely narrow hulls, though downriver racing kayaks are a hybrid style with whitewater boats. Modern kayaks are typically constructed from rotomolded plastic, wood, fabrics over wooden or aluminum frames, fiberglass, Kevlar, or carbon fiber. Most kayaks accommodate one or two paddlers, but some special-purpose boats may accommodate more. Kayaking in a double on Lake Union in Seattle, USA. The sea kayak, though descended directly from traditional designs and types, is implemented in a wide variety of materials, and with many distinct design choices. Sea kayaks as a class are distinct from whitewater kayaks and other boats by typically having a longer waterline (emphasizing straight travel through the water over extreme maneuverability), and provisions for below-deck storage of cargo. Sea kayaks may also have rudders or skegs (also for enhanced straight-line tracking), and such features as upturned bow or stern profiles for wave shedding. Modern sea kayaks often have two or more internal bulkheads to provide watertight internal sections for flotation and waterproof storage. Sea kayaks, unlike most whitewater kayaks, may be built to accommodate two or sometimes three paddlers. Certain sea kayaks can also be used for surfing. Kayaks made from thin wood sheathed in fiberglass have proven successful, especially as the price of epoxy resin has decreased in recent years. Two main types are popular, especially for the homebuilder: Stitch & Glue and Strip-Built. Stitch & Glue designs use modern, marine-grade plywood—typically quarter-inch (5mm) thick. After cutting out the required pieces of hull and deck (kits will often have these pre-cut), a series of small holes are drilled along the edges. Copper wire is then used to "stitch" the pieces together through the holes. After the pieces are temporarily stitched together, they are glued with epoxy and the seams reinforced with fiberglass. When the epoxy dries, the copper stitches are typically removed. The entire boat is then covered in fiberglass for additional strength and waterproofing. This construction method is fairly straightforward, but as the plywood does not bend to form curves, design choices are limited. This is a good choice for the first-time kayak builder as the labor and skills required(especially for kit versions) is considerably less than for strip-built boats. Strip-built kayaks are similar in shape to commercially available rigid fiberglass kayaks but are generally both lighter and tougher. Like their fiberglass counterparts the shape and size of the boat determines how they perform and what uses are optimal. The hull and deck are built with thin strips of lightweight wood, often Cedar, Pine or Redwood. The strips are edge-glued together around a form, stapled or clamped in place, and allowed to dry. This forms a wooden shell, which is not inherently strong. The boat's strength comes from a layer of fiberglass cloth and epoxy resin, inside and out. Strip built kayaks are sold commercially by a few companies, priced $4,000 and up. An experienced woodworker can build one for about US$400 in 200 hours, though the exact cost and time will be determined by the builder's skill, the materials chosen and the kayak's size/design. As a second kayak project, or for the serious builder with some woodworking expertise, a strip-built boat can be an impressive piece of work. Kits with pre-cut and milled wood strips are commercially available. Often an umbrella term for several types of kayaks, skin-on-frame boats are primarily considered a more traditional boat in design, materials, construction, and technique. They are often the lightest kayaks, and were traditionally made of driftwood pegged or lashed together and stretched seal skin, as those were the most readily available materials in the Arctic regions. Today, the seal skin is usually replaced with canvas or nylon cloth covered with paint, neoprene, or a hypalon rubber coating and the wood with aluminum. A special type of skin-on-frame kayak is the folding kayak, a direct descendant of the original Eskimo kayak. A folder is a modern kayak with a collapsible frame, of wood, aluminum or plastic, or a combination thereof, and a skin, of some sort of water-resistant and durable fabric. Many types have integral air sponsons inside the hull, increasing secondary stability and making the kayaks virtually unsinkable. Folders are known for their durability, stability, and longevity: The Klepper Aerius I, a single-seater, has been used successfully for white-water kayaking, due to its durability and excellent maneuverability, while many Kleppers have been in frequent use for more than 20 years. Folding kayaks exhibit many of the same paddling characteristics as the original skin-on-frame vessels of the circumpolar north. Of all modern kayaks, they are closest relatives to the skin-on-frame boats of the past. Kayaks were adapted for military use in the Second World War. They were used mainly by British Commando and Special Forces, principally the Combined Operations Pilotage Parties (COPPs), the Special Boat Service (at that time an Army unit) and the Royal Marines Boom Patrol Detachment. The latter made perhaps the best known use of them in the Operation Frankton raid on Bordeaux harbor.. Following the war the SBS was reformed as a Royal Marines unit and the Klepper Aerius II folding kayak became a staple of its training and operations. A paddler in a sit on top kayak explores Kealakekua Bay in Hawaii. Sealed-hull (unsinkable) craft were developed in the past for leisure use, as derivatives from surfboards (e.g. paddle or wave skis), or for surf conditions. Variants include planing surf craft, touring kayaks, and sea marathon kayaks. Increasingly, manufacturers are building leisure 'sit-on-top' variants of extreme sports craft these are normally built using polyethylene to ensure strength and keep the price down, often with a skeg (fixed rudder) for directional stability. Water that enters the cockpit drains out through scupper holes - tubes that run from the cockpit to the bottom of the hull. Sit-on-top kayaks usually come in single and double (two paddler) designs, although a few models accommodate three or four paddlers. Sit-on-top kayaks are particularly popular for fishing and SCUBA diving, since participants need to easily enter and exit the water, change seating positions, and access hatches and storage wells. Ordinarily the seat of a sit-on-top is slightly above water level, so the center of gravity for the paddler is higher than in a traditional kayak. To compensate for the center of gravity, a sit-on-top is often wider than a traditional kayak of the same length, and is considered slower as a result. Recreational kayaks are designed for the casual paddler interested in fishing, photography, or a peaceful paddle on a lake or flat-water stream; they presently make up the largest segment of kayak sales. Compared to other kayaks, recreational kayaks have a larger cockpit for easier entry and exit and a wider beam (27–30 inches) for more stability on the water; they are generally less than twelve feet in length and have limited cargo capacity. Using less expensive materials like polyethylene and including fewer options keep these boats inexpensive (US$300–$600). Most canoe/kayak clubs offer introductory instruction in recreational boats as a way to enter into the sport. Sometimes advanced paddlers still use recreational kayaks. They can fit all levels, but sometimes do not perform as well in the sea. The recreational kayak is usually a type of touring kayak. Whitewater kayaks for casual use are generally rotomoulded in a semi-rigid, high impact plastic, which is usually polyethylene: careful construction is needed to ensure adequate rigidity from the completed boat. This material allows these kayaks to bounce off rocks without suffering leaks, although they can fold up trapping a paddler and accumulate deep scratches very readily. They are shorter than other types of kayaks, ranging from 5.5 to 10 feet (2 to 3 meters) long. Modern design has moved toward shorter boats, which make them very maneuverable but slow, and the rather soft and flexible skin slows them down even more. However, whitewater boats do not need great speed, because they are used for recreation: not always flowing downstream, since many kayaks are used for playing up and down a patch of white water. In "freestyle" competition ("kayak rodeo"), whitewater kayakers exploit complex water movements of rapids to do tricks, while moving up and down stream along a short stretch of the river. Ultra-low-volume kayaks that are designed to be paddled both on and below the surface of the water are used in Squirt Boating. Racing white water kayaks like all racing kayaks are made to regulation lengths making them longer than the ‘play boats’, and are generally made out of fiber reinforced resin for speed: stiffer, lighter, and less readily scratched than play boat construction. Repairs are often necessary especially if the paddler is inexperienced. Slalom kayaks are flat hulled, highly maneuverable, and stable but not very fast in a straight line; downriver white water racers have a combination hull with a fast but unstable lower section similar to a flat water racer's hull flaring out into a wider section higher up similar to a slalom hull to provide stability in big water. Surf kayaks (ski) Alexandra Heads Surf Life Saving Club, Queensland. Traditional surf kayaking comes in two main varieties, High Performance (HP) Surf Kayaks and International Class (IC) Surf Kayaks. HP boats tend to have a lot of nose rocker, very little to no tail rocker, very flat hulls, very sharp rails and up to three fins. This enables them to generate lots of speed and be able to pull very dynamic moves. IC boats have to be at least 3 m long and have to have a convex hull, the surfing of international boats tends to be smoother and more flowing. International class is often thought of as the long boarding of the kayaking world. Surf boats come in a variety of constructions ranging from tough but heavy plastics through to super light, super stiff but rather fragile foam cored Kevlar carbon. Surf Kayaking has become popular in locations were you will find traditional surfboard surfing, as well as new locations such as the Great Lakes. A variation on the closed cockpit surf kayak is an open cockpit design called a waveski. Although the waveski utilizes similar dynamics, in terms of paddling technique and surfing performance on the waves, construction can be very similar to surfboard designs. Elite waveski surfers are able to more closely imitate surfboard maneuvers. 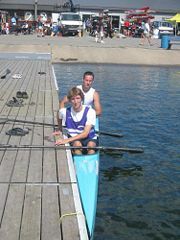 A typical racing K2 design, at the Canadian Masters Championships, 2005. Note the extremely narrow beam. boat units: men and women K1, K2, K4; men canoe C1, C2, C4 All units compete on all distances. Each country can send one unit per event. events: men K1-K2 500m, K1-K2-K4 1000m; women K1-K2-K4 500m, men canoe C1-C2 500m, C1-C2 1000m. Each country can send one unit per event. Flatwater racing kayaks are generally made out of extremely lightweight composites such as Kevlar, carbon fiber, or fiberglass. They are not intended for any condition other than flat water. They are narrow, extremely unstable, and expensive, with a competitive K1 or K2 running in the US$2000 - US$4000 range. They require a good level of expertise to paddle well, but are extremely fast in the hands of proficient users. The beam of a flatwater boat is typically barely wider than the hips of the person who paddles it, allowing for a very long and narrow shape to reduce drag. On account of their length, (a K1 is 5.2m (17 ft) long and a k2 is 6.2m (20 ft) long), sprint boats come equipped with a rudder to help with turning. The rudder is controlled by the feet of the paddler (the foremost paddler in multi-person designs). In spite of this, these boats have a fairly large turning radius. Flatwater racing kayaks are closely related to flatwater racing canoes, with both styles of boat usually training at the same club or with the same team, although it is rare for paddlers to compete in both canoes and kayaks. A highly specialized variant of flatwater racing kayak called a Surf Ski has an open cockpit and can be up to twenty-one feet long but only eighteen inches wide, requiring expert balance and paddling skill. Surf Skis were originally created for surf and are still used in surf races in New Zealand, Australia, and South Africa. They have become very popular in the United States for ocean races, lake races and even downriver races. Kayaks designed for Slalom canoeing have a relatively flat hull for maneuverability and—since the early 1970s—low profile decks. Like all racing kayaks, they are usually made of fiber reinforced resin (usually epoxy or polyester reinforced with Kevlar, glass fiber, carbon fiber, or some combination). This form of construction is stiffer and has a harder skin than non-reinforced plastic construction such as rotomoulded polyethylene: stiffer means faster, and harder means fewer scratches and therefore also faster. The term "kayak" is increasingly applied to many craft that diverge substantially from traditional kayaks. Another special type of kayak is the inflatable kayak. Inflatable kayaks usually can be transported by hand using a carry bag. They are made of hypalon (a kind of neoprene), polyvinyl chloride (PVC), or polyurethane-coated cloth. They can be inflated with foot, hand or electric pumps. Multiple compartments in all but the least expensive increase safety. They generally use low pressure air, almost always below 3 psi. Until recently, inflatable kayaks have been non-rigid boats, essentially pointed rafts, and best suited for use on rivers and calm water. However, recently some manufacturers have combined folding kayak design principles (notably the use of an internal frame) with "sit-on-top kayak" (see above) overall design using multiple inflatable sections to produce a seaworthy inflatable sea kayak. Besides being portable, inflatable kayaks generally are stable with a small turning radius and are easy to master, but they take more effort to paddle and are slower than traditional kayaks. A special type of kayak using pedals allows the kayaker to propel the vessel with a propeller or underwater "flippers" attached to pedals in the cockpit, rather than with a paddle. This allows the kayaker to keep his or her hands free for fishing or other activities, but introduces a somewhat delicate mechanical component into the boat and eliminates the paddle as a tool for capsize-prevention and self-rescue. Traditional multi-hull vessels such as catamarans and trimarans benefit from increased lateral stability without sacrificing their speed but these advantages cannot be successfully applied in all multihull kayak models Outrigger kayaks, are equipped with either a single or a pair of usually smaller hulls (outriggers) attached to the main hull to provide additional stability, especially for fishing, touring and kayak sailing. Twinhull sit-on-top and sit-in kayaks have been on the market for many years. The inflatable models are popular in whitewater and fishing applications and the Polyethylene models in fishing and recreation. While native people of the Arctic regions did not rely on kayaks for fishing, in recent years sport fishing from kayaks has become popular in both fresh and salt water, especially in warmer regions. Specially designed fishing kayaks have emerged, with designs similar to those of recreational sit-in and sit-on-top kayaks characterized by very wide beams (up to 36 inches) that increase lateral stability. 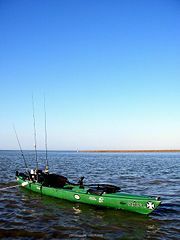 Some fishing kayaks are equipped with outriggers for this reason, and the newer twinhull models are stable enough to enable paddling and fishing in the standing position. In the past several years kayak fishing has become a huge sport. The popularity has grown due to the ease of entry. Kayaks can be purchased inexpensively and have little maintenance costs. Kayaks can be stored in small spaces and launched quickly. Many kayak dealers across the U.S. have started customizing their kayaks for fishing. Although paddling in the standing position has been practiced for centuries in canoes (including Umiaks, Pirogues, native dugout canoes worldwide etc.) it is only recently that paddlers have begun to paddle standing in kayaks as a recreational activity. This is called 'striding', and involves paddling wide, inflatable kayaks down fast rivers while strapping the ankles to the kayak - similar to what is being done with skis in snow sports. Modern kayaks differ greatly from native kayaks in every aspect – from initial conception through design, manufacturing and usage. Today almost all kayaks are conceived as commercial products intended for sale and not necessarily just for the builders’ personal use. While native kayak builders used their personal experience in combination with knowledge they acquired from orally transmitted traditions, modern kayaks are designed with CAD (Computer Aided Design) software programs, often in combination with naval design software, and in some cases with special kayak design software. Modern kayaks differ greatly from native kayaks in usage and therefore in shape: Nearly one of every three kayaks sold today is a sit-on-top (SOT), which is basically a paddleboard equipped with a seat. Unlike traditional kayaks many kayaks today are designed for whitewater and surf applications, and are extremely short (some measure less than 6 feet (1.8 m) in length). Other modern designs are extremely wide (e.g. recreational, fishing). Some modern kayaks are equipped with one or two extra hulls (outriggers) to increase their stability, some have twin hulls (catamaran kayaks, W kayaks), some are inflatable, and some are no longer propelled by the traditional dual blade paddle (‘kayak paddle’) but by means of pedals that activate a propeller (‘pedal kayaks’). In fact, some modern kayaks are no longer using human powered propulsion at all but are sailed (‘sailing kayaks’) or propelled by a trolling motor – usually an electric one. Even kayaks that copy traditional forms (e.g. monohull sea kayaks, touring kayaks) are considerably different from the original native designs that serve as inspiration for them: They are equipped with specially designed seats and foot braces that no native kayak ever featured, they are often equipped with a rudder system, which is totally alien to native kayak design, and they feature bulkheads, floatation, hatches and eyelets that native kayaks never had. Most kayaks today including the ones inspired by ancient forms are manufactured entirely from plastic resins or from such materials in combination with other materials (e.g. synthetic fibers, plywood, wood strips). This is why hardly any modern kayak features the traditional frame made of ‘ribs’ over which native kayak builders used to stretch sealskins sewn together. In sum, modern kayak designs reflect the diversity in usage as well as the advancement in design and manufacturing technologies. The design of different types of kayak is largely a matter of trade-offs between directional stability ("tracking") and maneuverability, and between stability (both primary and secondary stability) and overall speed. Length: As a general rule, a longer kayak is faster while a shorter kayak may be turned more quickly - but the higher potential top speed of the longer kayak is largely offset by increased friction. Kayaks that are built to cover longer distances such as touring and sea kayaks are themselves longer, generally between 16 and 19 feet (5.8 m). A flat water racing K1's maximum length governed by the ICF is 17 feet (5.2 m). Whitewater kayaks, which generally depend upon river current for their forward motion, are built quite short, to maximize maneuverability. These kayaks rarely exceed eight feet in length, and some specialized boats such as playboats may be only six feet long. The design of recreational kayaks is an attempt to compromise between tracking and maneuverability, while keeping costs reasonable; their length generally ranges from nine to fourteen feet. Rocker: Length alone does not fully predict the maneuverability of a kayak: a second design element is rocker: the curvature of the kayak from bow to stern. A heavily "rockered" boat has more lengthwise curvature than a boat with little or no rocker, meaning that the effective waterline of the rockered boat is less than for a kayak with no rocker. For example, an 18-foot (5.5 m) kayak with no rocker will be entirely in the water from end to end. In contrast, the bow and stern of an 18 footer with rocker will be out of the water, so its lengthwise waterline may be only 16 ft (4.9 m). Rocker is generally most evident at the ends, and in moderation improves handling. Similarly, although a whitewater boat may only be a few feet shorter than many recreational kayaks, because the whitewater boat is heavily rockered its waterline is far shorter and its maneuverability far greater. Fish form: the widest part is forward of the midpoint. Swede form: the widest part is aft (in back) of the midpoint. The presence or absence of a V bottom at various points affects the kayak's tracking and maneuverability. A V tends to improve the kayak's ability to travel straight (track), but reduces the ease of turning. Most modern kayaks have steep Vee sections at the bow and stern, and a very shallow Vee amidships. Beam profile: Hull shapes are categorized by the roundness (or flatness) of the bottom, whether the bottom comes to a "V" at various points on the hull, and by the presence, absence, and severity of a chine, where the side and bottom of a hull meet at an angle, creating another edge below the gunwales. This design choice determines the tradeoff between primary and secondary stability. The hull design determines the relative primary stability and secondary stability of a kayak, the resistance of the boat to tipping and to ultimate capsize, respectively. Primary and secondary stability: Although every kayak will rock from side-to-side, wider kayaks with more buoyancy away from the centerline will present more resistance to tipping and thus feel less likely to capsize than a narrow one with less buoyancy away from the centerline. Flat-bottomed boats that push their volume away from the centerline will also feel more stable than rounded or V-shaped hull shapes that distribute buoyancy more evenly. While flat-bottomed boats have more primary (sometimes called "initial") stability, and feel more stable to the beginner they usually have less secondary stability. Once they do begin to tip, they capsize quickly and suddenly. Rounder-bottomed boats are quite the opposite—having lower initial or primary stability and (usually) greater secondary stability. The chine in some boats increases secondary stability by effectively widening the beam of the boat when it is heeled (tipped). Secondary stability refers to final stability, or additional resistance to capsizing as a kayak approaches capsizing. Rounder-bottomed boats present a greater cross-section to the water as they are tipped from level ("heeled"), while very flat-bottomed boats present less. Sea kayaks, designed for open water and rough conditions, are generally narrower (22-25 inches) and have more secondary stability than recreational kayaks, which are wider (26-30+ inches), have a flatter hull shape, and more primary stability. Kayaks with only moderate primary, but excellent secondary are, in general, considered more seaworthy, especially in challenging conditions. Until recently, whitewater kayaks had very rounded and rockered hulls, but changes in design philosophy have led to whitewater kayaks with very flat planing hulls that allow them to surf on top of moving water rather than float in the water (displacement hull). ↑ Home Page, (English). Munich State Museum of Ethnology. Retrieved September 9, 2008. ↑ Cockle Mark II. The Canvas Kayak Website. Retrieved September 9, 2008. ↑ Common Construction of a Sit on top kayak. Shore.co.uk. Retrieved September 9, 2008. Cunningham, Christopher. 2002. Building the Greenland Kayak : A Manual for Its Construction and Use. Camden, ME: Ragged Mountain Press/McGraw-Hill. ISBN 0071392378. Heath, John D., and Eugene Y. Arima. 2004. Eastern Arctic Kayaks: History, Design, Technique. Fairbanks, AK: University of Alaska Press. ISBN 978-1889963259. Hutchinson, D.C. 1995. The Complete Book of Sea Kayaking, 4th ed. Old Saybrook, CT: Globe Pequot Press; London, UK: A & C Black. ISBN 9781564407221. Johnson, Shelley. 2001. The Complete Sea Kayaker's Handbook. London, UK: McGraw-Hill. ISBN 9780071362108. Kulczycki, Chris. 2001. The New Kayak Shop: More Elegant Wooden Kayaks Anyone Can Build. Camden, ME: Ragged Mountain Press / McGraw-Hill. ISBN 0071357866. KayakPaddling.net Animated kayak paddling tutorials - multilingual. International Canoe Federation The International federation of kayak and canoe bodies. This page was last modified on 14 April 2018, at 15:29.